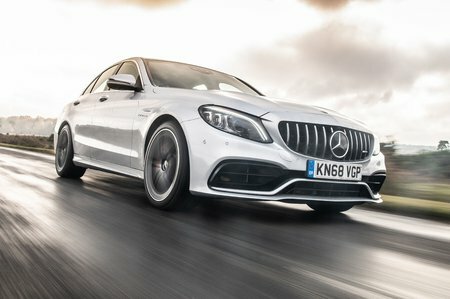 Mercedes-AMG C63 Performance, Engine, Ride, Handling | What Car? While the M4 is super-quick around a race track and technically brilliant, it can feel a little sterile at normal road speeds. Not so the C63. Perhaps it’s slower in outright lap times, but, like the Giulia QV, it offers more theatrics, making it arguably more fun for everyday use. Start the big V8 and it thunders away like an old American muscle car, and even more vehemently when you switch on the sports exhaust (standard on the coupé and convertible but optional on the saloon and estate). It sounds heroic simply dawdling along in traffic, especially in the convertible with its roof down. Yet mash the accelerator and you’ll discover that the C63 isn't merely bluster but a full-on performance machine. The coupé is quickest, with the heavier saloon, estate and convertible trailing it fractionally, but you'd struggle to tell without using a stopwatch. There’s minimal delay between applying the accelerator and the turbochargers winding up, making the C63 perfectly predictable despite all that poke. 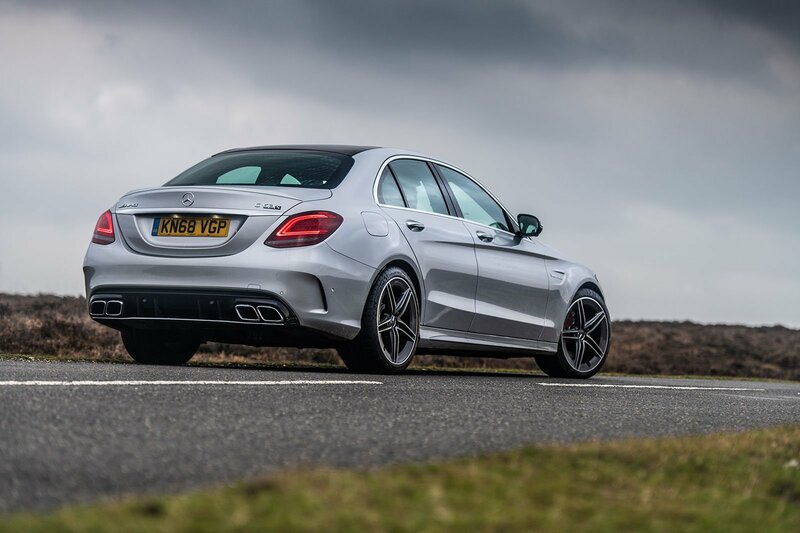 Then, once its ultimate potential is realised, the C63 builds speed like a dropped dumbbell. The S version, with its extra 34bhp, feels quicker still and adds that final layer of excitement, making it our choice. The only frustration is that when using the gearbox in manual mode, you have to make absolutely sure you pull for an upshift before the engine runs into its soft limiter, because once it does, you're held there, unable to change gear for a moment or two, like a naughty boy being taught a lesson in abstinence. When you’re not flat out, the C63 is generally as docile and easy to drive as any regular C-Class. The nine-speed automatic gearbox is pretty good but not the best. It’s a tad jerky when you're trying to park and its shifts aren’t as punchy or responsive as those of the Guilia QV. It's smooth enough once you're up and running, though. You can alter the feel of the C63’s suspension with a mode switch on the centre console. In the softest Comfort mode, the ride is firmer than the Giulia QV's in its equivalent setting, but the C63 still has just enough give that it never crashes harshly, even if it does thud a little over sharp ridges and deep potholes. It traverses larger obstructions, such as speed humps, remarkably well, too. For quick driving, Comfort mode keeps body roll well checked, but the best setting for road use is the midway Sport or even the firmest Sport+. These make full use of the C63's nimbleness, so it changes direction extremely well for what’s still a comparatively heavy car. It matches the delicate balance and adjustability of the Giulia QV and completely trounces the stodgy and wayward RS4 Avant for driving pleasure. There's a mass of grip, too. In fact, considering the power at play, the C63 is surprisingly docile, and when its rear-driven wheels do lose purchase, the resulting slide is easier to manage, and therefore arguably more fun, than in the snappier M4. The standard C63 has a mechanical limited-slip differential, while the electronic differential in the C63 S makes it even easier to control on the limit. There's also a variable traction control, which you can turn up or down to let you have just the right amount of slip, reducing the worry about ending up heading backwards through a hedge. That's a big boon over the Guilia QV, in which the traction control is a binary on or off. The steering is a pleasure. It’s not overbearingly heavy around town and weights up beautifully as you build speed through turns. Little messages percolate up through the steering wheel to keep you informed and connected to the road's surface beneath, giving you the confidence to push on. Whichever bodystyle you choose, the C63 will eat up the miles when you need it to. Wind noise is pretty hushed at speed, and while you have to put up with a bit of road roar from the fat rear tyres, it’s not overbearing. Mind you, it's fair to say that refinement is one area in which the RS4 Avant has the C63 beaten.